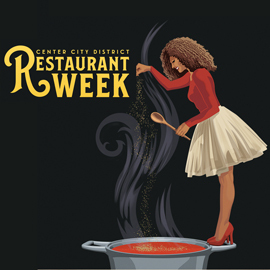 Center City District Restaurant Week, presented by Maker’s Mark Bourbon and El Tesoro Tequila and supported by OpenTable and Lyft, is more popular than ever and is returning in January for nearly two weeks! From January 13-25, 2019, more than 115 participating restaurants will serve three-course dinners for $35 per person and three-course lunches for $20 per person (excludes tax, gratuity and alcohol). New restaurants for this season include Bai Wei, Sedition, Mission Taqueria, Giuseppe & Sons, and Fat Salmon. Follow @PhilaRestWeek on Twitter and Instagram for the latest updates. Get to work on those resolutions with FREE weekly ice skating workouts led by professional trainers every Tuesday from January 8 – February 19 at 12pm. From 7-10pm every Friday, enjoy Karaoke Nights powered by Live Nation. Sing the night away with tunes, drinks, food and a good time to end the workweek. Calling all superheroes! Kids are invited to set flight across the Rothman Orthopaedics Ice Rink and show off their best superhero costumes for a day filled with character meet and greets and tons of family fun sponsored by Keller’s Creamery while Temple University students distribute free superhero capes emblazoned with the Temple “T” logo. 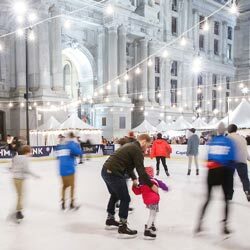 The holidays may be over but the wintertime activities continue at Dilworth Park with new programming for children and adults to usher in the new year at the Rothman Orthopaedics Ice Rink and Rothman Orthopaedics Cabin. For more details, visit Free in February. Visit DilworthPark.org for the full schedule of events and follow @CCDParks on Twitter, Instagram, and Facebook, for the latest news and information. 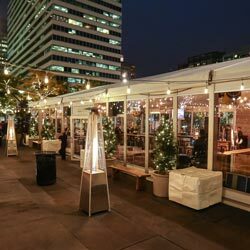 Rent the Rothman Orthopaedics Cabin in Dilworth Park - The coolest place to host your winter event! Looking for a place to host your special event? With its heated space indoors, fire pits outdoors and City Hall as an iconic backdrop, the Rothman Orthopaedics Cabin is perfect for corporate events, cocktail parties, team building exercises or fundraisers. For more information, visit DilworthPark.org or to book your special event, contact Venue Sales Specialist Sarah Anello at rentals@centercityphila.org or 215.440.5507.